Well, hello friends. You might think there’s been little news from our end given the gap in posts. Not so, though. Plenty of exciting projects happening in the CAM world. Adam Klein & The Wild Fires are pleased to be releasing their first album together (Klein’s 5th), Sky Blue DeVille, on April 15th, 2013. A fine record and a stellar sound. Many thanks to the Pledge Music supporters! Visit Adam’s site to pre-order the album. Or pre-order via Bandcamp and receive an immediate download of the title track! Shows coming up in Birmingham, Columbia, Athens, Atlanta, Durham, NC, plus a CD Release tour up to Boston, NYC, Baltimore, etc. Check the Tour page for dates. 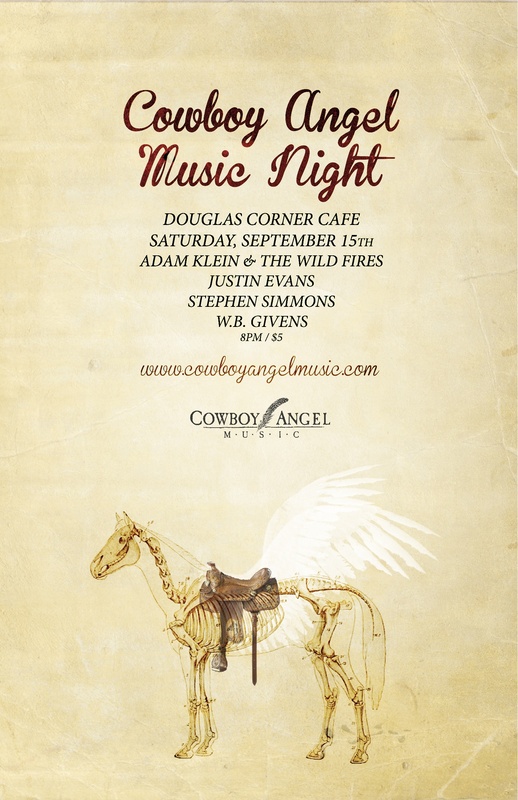 And we’re pleased to announce the 6th annual Athens Americana, now Twilight Americana Music Festival in downtown Athens April 25th-28th! Get excited for a fantastic line-up, which will be announced soon. Mosey over to www.athensamericana.com for info and updates. Hope everyone’s in the swing of things now that we’re rolling through September. 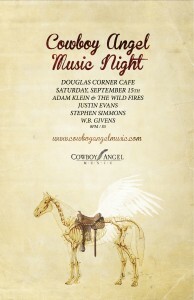 SAT SEPT 15th @ Douglas Corner Cafe (8pm): Adam Klein & The Wild Fires, W.B. Givens, Stephen Simmons, and Justin Evans. Shows are coming up in the southeast. Visit the Tour page for info on upcoming shows from Adam Klein & The Wild Fires (TN, AL, GA), The Kenney-Blackmon String Band (GA, NC), Little Country Giants (GA), Bill Mallonee (GA, SC), and Justin Evans (TN). 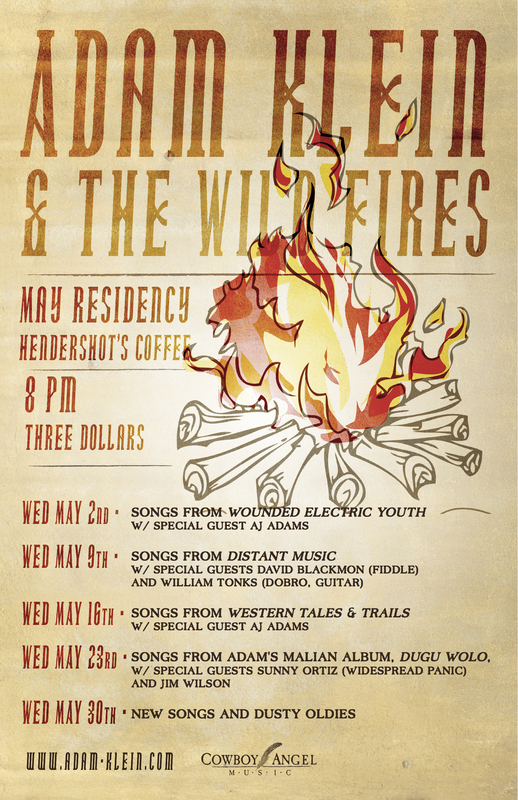 Adam Klein & The Wild Fires are in residency every Wednesday night in May @ one of our favorite spots, Hendershot’s Coffee in Athens. 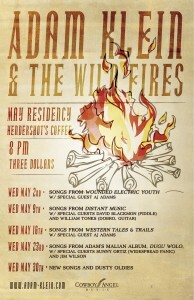 Each week they’ll perform a different Adam Klein album with special guests. Info on flyer below, and check the Tour Dates page for Wild Fires dates around the southeast this month (GA, TN, NC, SC). They’ll be in the studio next weekend working up some analogue magic for an upcoming 7″ vinyl release. We’re pumped. In the meantime, the lovely Little Country Giants are putting on the finishing touches to their latest record, 60 Grit, and will be touring its release the next few months. Details to come. Go say hi here and here.